Eureka Dry Tech Auto Dry Box, Dry Cabinet & Electronic Desiccators utilizes multi-porous molecular sieves in its dehumidifier core units and involves two stages. The first stage is the “Adsorption Stage” and the next stage is the “Exhaust & Regeneration Stage." During the adsorption stage, the dehumidifier core unit's valve doors open on the inside and seals from the outside. This allows moisture inside the dry cabinet to be naturally adsorbed into the multi-porous molecular sieves in the core unit. During this stage, the core unit performs its desiccating function without any power consumption and will continue to desiccate even when power supply is interrupted. Operational light indicators inside the cabinet will remain off during this time. Moisture adsorbed by the multi-porous molecular sieves is expelled by the drying unit and the core unit is automatically regenerated for moisture adsorption. 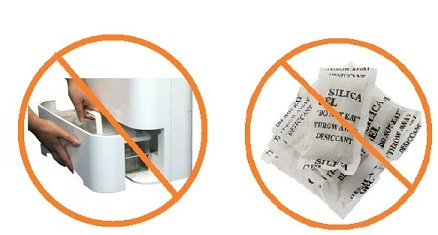 There are no water tanks to empty, desiccant bags & packs to replace, or any other maintenance required by the user. Simply plug in the power cord, set the desired RH level and the Eureka Auto Dry Box will begin its dehumidifying operation cycle. The core unit performs the moisture adsorption process without any power required. Thus is safe and clean for the environment.